I set my son to a task last week. “Take all manner of tools down the driveway and start clearing the brush off of the fenceline,” I told him. I passed him on my way out to run errands as he carried the tools and headed to the appointed spot. When I returned home, perhaps an hour later, he did not appear beside the driveway, nor did a large pile of brush greet my arrival. As I motored past, I grumbled at this failure to launch. Yesterday, I set Tom to another task. 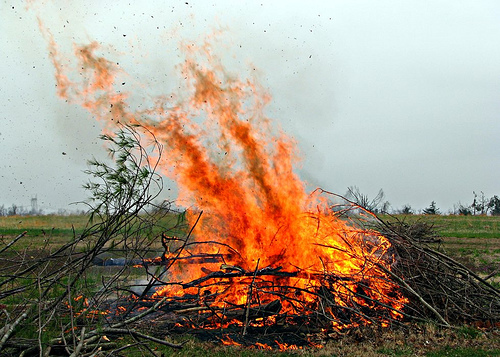 Having hacked down a mountain of small trees and saplings, I glared at the piles beside the driveway and paled at the thought of moving them to my burning area. I delegated the job to Tom. Curiously, this task, unlike the assault on the fenceline, ended in a magnificent success. Across the span of the afternoon, Tom, assisted by a friend Jared, dragged, piled, cut, and otherwise transported this immense mound of vegetation to the spot in the pasture where I could safely torch it. As I set to work mowing nearby, the pair of them drove by on the lawn tractor and trailer, waving at me. They had finished. Where did the difference lay? We might argue that the job of moving the brush proved simpler than of hacking it down, but I would expect another explanation to be the right one. Yesterday, Tom had Jared. Jared had Tom. The pair of them encouraged each other and kept each other on the task. How hard is it for us to live the Christian life in solitude? Some might manage it, but most of us would fail miserably. That’s what today’s verse reminds us. While God’s power is infinite and his faithfulness unbounded, ours are decidedly limited. Just as my fenceline, left to its own devices, will grow up in thorns and vines in short order, my attentiveness to holiness, left alone, tends to stray. Let us encourage each other. While moving brush or moving through life.